If there is a new name to be engraved on the Stobart Flat Jockeys Championship trophy at the end of this season, there is a good chance it could be the one of Oisin Murphy. After finishing second behind three-times champion Silvestre de Sousa last year, many people believe the 23-year-old has what it takes to go one better this time round. But although having the support of both Qatar Racing and Andrew Balding, among others, behind him, Murphy feels he will have his work cut out if he is to claim the coveted prize. Murphy said: “To be honest there was a lot of talk about me going for the championship last year. I tried my best and I wasn’t good enough in the end. “There are lots of good riders out there and racing is the most competitive environment in the world. You have got to think how many multiple Group One-winning jockeys that are riding – it is such a long list and nearly all could be champion jockey. Before focusing on mounting a title challenge, Murphy will bid to address a glaring omission on his already impressive CV by claiming a first British Classic aboard the Martyn Meade-trained Advertise in next month’s Qipco 2000 Guineas at Newmarket. He said: “Advertise has got a few targets to come through work-wise, but everyone is very pleased with what he has done through the winter. He has changed physically and has really strengthened up. “The Guineas is a very hard race to win and Too Darn Hot was very hot last year and we are under no illusions about the task he faces, but I have lots of faith in him. “The Guineas is another test for both horses, but they have both run at the track. Advertise is a beautifully-balanced horse and he handled it (Newmarket) no problem and I believe he will get the mile. Last season saw Murphy really come of age thanks to a string of Group One victories, led by the now-retired Roaring Lion. He said: “Roaring Lion was a tremendous horse and I was lucky to be connected to him. Everyone got a big thrill out of him, as he was just very genuine. “The Juddmonte win was massive, as was the QEII in front of Her Majesty and Sheikh Fahd and all of his brothers. “For me though Ireland (Irish Champion Stakes) was probably the stand-out moment, as it was special to win a Group One at home in front of your friends and family. 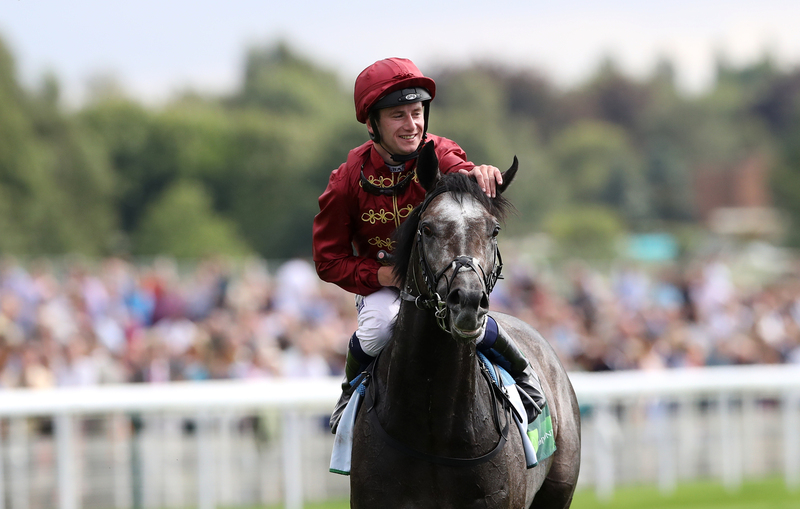 Finding the next Roaring Lion is all part of the game and while Murphy hopes Advertise can help him celebrate more top-level triumphs, there are two other horses he expects to shine this season. He added: “Special horses like Roaring Lion are hard to find and it is now about trying to find new horses to replace horses like Roaring Lion. That is what makes you get out of bed – having these good horses to ride. “Bell Rock is a son of Kingman, who won a seven-furlong maiden at Newmarket. He was a big price that day, but Andrew (Balding) really liked him. He is one to look forward to. “Sparkle Roll won nicely second time out at Haydock. She is a big, scopey filly and has improved from two to three – John Gosden is pleased with her.